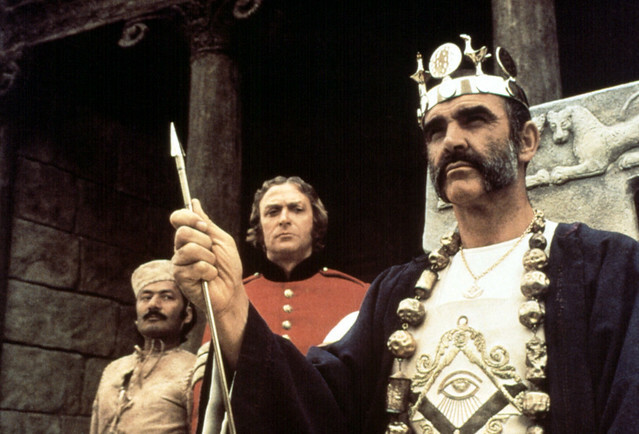 TCM will air The Man Who Would Be King at 8 p.m. tonight (June 6) as part of its Essentials series. The classic Rudyard Kipling tale stars Saeed Jaffrey (left), Michael Caine, and Sean Connery. I'll outline five things to look for in this action-adventure movie. The Man Who Would Be King is a classic action-adventure tale in the style of Gunga Din (1939) and Beau Geste (1939). The film was a dream project for director John Huston, who helmed such classics as The Maltese Falcon (1941), The Asphalt Jungle (1950), and The African Queen (1951). The Man Who Would Be King features great performances from Michael Caine and Sean Connery as a pair of ex-British soldiers who through sheer dumb luck (and I mean the dumb part quite literally) become rulers of an isolated area of Afghanistan called Kafiristan. Huston's Dream Project: Anglo-Indian writer Rudyard Kipling was Huston's favorite author. He dreamed of making a film out of Kipling's novella, but Huston couldn't get the financing together until the 1970s. Huston originally planned to make the film in the 1950s with Humphrey Bogart and Clark Gable. When first Bogart and then Gable died, he settled on Richard Burton and Peter O'Toole, but that version of the film fell through. Finally, he chose Paul Newman and Robert Redford, but both stars demurred. Newman told Huston that only British actors could play the larger than life characters of cockney Peachy Carnehan and Scotsman Daniel Dravot. Connery and Caine: Newman suggested Connery and Caine to Huston, and his instincts were spot-on. The actors have great onscreen chemistry and they perfectly embody Peachy (Caine) and Daniel (Connery), two ex-British officers who aren't the sharpest tools in the shed but somehow manage to stumble their way into being treated like deities. Caine is particularly fine as Peachy, who is marginally the more intelligent of the two men. Caine uses his natural Cockney accent to embody Peachy's sly charm while shouting exclamations like "God's holy trousers" or explaining the finer points of blackmail to a bureaucrat (Jack May). Kipling's Novella: Kipling's novella is a satire of the British Raj, but he did base Peachy and Daniel's exploits on two real men. First is British adventurer Sir James Brooke, who became Rajah of Sarawak, a state on the island of Borneo, in 1832 after he helped the sultan of Brunei suppress a rebellion. Kipling's other model was Josiah Harlan, an American mercernary who became the prince of the Afghan province of Ghor after giving the locals military aid. British Raj: Many old Hollywood films glorify British rule in India, but The Man Who Would Be King is a satire about the follies of the Raj. Both Peachy and Daniel are basically morons, but they think they have a God-given right to rule simply because they are British (clip below). Supporting Players: The Man Who Would Be King features three great supporting performances. Christopher Plummer, who is nearly unrecognizable behind a bushy mustache and glasses, gives a great performance as Kipling. Caine's wife, Shakira, plays Daniel's reluctant love interest, and 103-year-old Karroom Ben Bouih gives a memorable turn as a high priest.